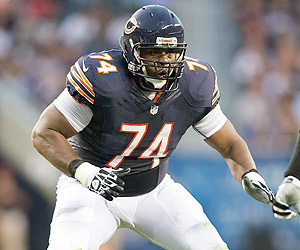 Bears left tackle Jermon Bushrod will return home to host the fourth annual Visualize & Rize Charity Golf Tournament and Football Camp June 13-14 in King George, Va.
Jermon Bushrod The weekend event benefits Bushrod's Visualize & Rize Foundation, which he established in 2010 as a way to give back to the community that helped shape him as a person. The mission of the foundation is "to provide support to youth sports and education programs, to enable students and provide them with the necessary tools to encourage them to reach their full potential." It seeks to inspire youths to become leaders and positive influences in their communities and to motivate them to achieve their dreams. The golf tournament will be held June 13 at Cameron Hills Golf Course. Registration begins at 7 a.m. with an 8 a.m. shotgun start for the first flight and noon with a 2 p.m. shotgun start for the second flight. The tournament is open to individuals ($100), pairs ($200) and teams ($400). Over the past three years, the golf tournament has generated over $85,000 for local youth programs including the King George High School football program and the King George YMCA as well as in the form of book scholarships to graduating student-athletes from King George High School and six other high schools in the surrounding counties. The free football camp for children ages 6-14 will begin at 10 a.m. on June 14 at King George High School. The camp is designed to build character and to instruct players in the basic fundamentals of football. Emphasis will be placed on positioning, skills and overall knowledge of the game. NFL players who are expected to join Bushrod include the Bears' Roberto Garza and Matt Slauson, the Panthers' Roman Harper, the Ravens' Torrey Smith and Gerrard Sheppard, the 49ers' Jonathan Goodwin, the Jets' Johnny Patrick and the Buccaneers' Carl Nicks.